Rare Hilt Form Older Moro Kris. Late 18th to early-mid 19th century Kris.A very rare and older tulip form hilt probably of Tausug origin ; Silver trim and blade clamp. A fighting sword of a high status individual. Origin: Sulu Archipelago, PhilippinesThis kris is of an archaic style, from the period when the Philippines was transitioning from the Indonesian/Malay style of keris to a more robust, uniquely Moro form. Laminated steel blade with an “arrow” design chiseled near the hilt. Hilt is carved wood with a small kakatua pommel and brass fittings. 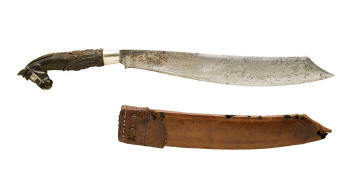 This straight, heavy bladed kris is typical of Mindanao kris from the late 19th C. This one carries two inscriptions, “Dr. W.A. Christensen Reina Regente,” and a fainter one, “From Datu Piang Mindanao.” Dr. Waldemar A. Christiansen was a physician with the U.S. forces in the Philippines during and after the Spanish-American War. He was stationed at the former Spanish fort of Regina Regente, South Cotobato from 1904 to 1906. Datu Piang, the head datu of the Maguindanao people, was the most powerful Moro leader in the early 20th century and his compound was adjacent to Reina Regente. This sword likely was presented to Dr. Christiansen by Datu Piang during the doctor’s time in southern Mindanao. Provenance: Acquired from the estate of Dr. Christiansen’s daughter. Maguindanao or maranao tribe. 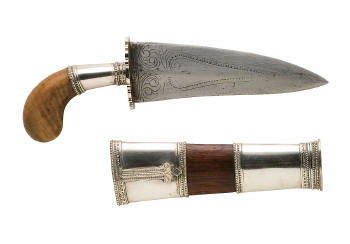 Datu class, excellent silver encased horse-hoof style hilt decorated with very intricate okir designs. Blade is laminated, also with okir deisgns. 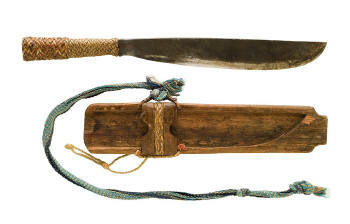 Although made for a Datu, or chieftain, this sword is fully functional as a weapon. Scabbard has silver bands. Please note the crossguard is made out of the rare banati wood, prized for its tiger stripe like burls. Maguindanao tribe, west coast of Mindanao Island. Kris belonged to datu. The hilt is wrapped in black lacquerd with gold mounts. The pommel is composed of mother-of-pearl, ovoid turtle shell, and gold. The straight has thick silver asang-asang clamps. Near the base on the blade there is a section of engraved okir design on both sides. The scabbard is narra wood with 3 bands of white brass. Scabbard is in the Maguindanao style without a crosspiece. 18th. CenturyTausug Tribe. Narrow blade with 3 waves and chiseled naga center panel down middle in mechanical damascus steel. Silver clamp. Dark narra wood pommel with chased basket weave silver grip and okir top and bottom. I made walnut scabbard with chased silver bands in early Tausug style. A small example preferred by some warriors, easily concealed because of its small size. 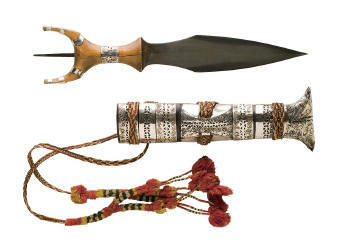 Traditional okir carving on sheath, laminated heavy steel blade long silver ferrule (punto); this is a fighting example as shown by the simple crest on the handle. 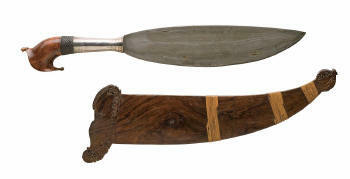 The swollen edge and leaf-shaped blade identifies this sword as a shandigan barung. The blade has been etched with a weak acid solution to reveal the laminated steel pattern and evidence of an inserted hardened cutting edge. The hilt has a banati wood pommel and a silver punto or ferrule. The pommel is a large, flamboyant example of the kaktua style of hilt, called junggayan. The junggayan hilt is reserved for prominent Moro dignitaries such as datu. Tausug or Samal tribe. Rare example of what is referred to as Shandigan barung. Please note the protrusion of blade’s edge. Another excellent quality of this barung is its laminated blade, which creates horizontal lines running along its whole length. Hilt is made out of banati wood, with the punto, or ferrule, made out of silver. Jute bands are added for maximum gripping. 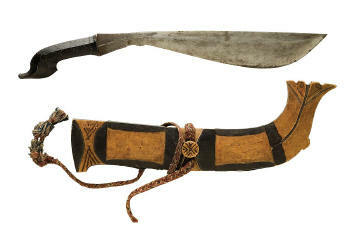 Tagub or scabbard isalso made out of banati wood, which has the typical okir designs by the throat and toe. Samal tribe, Sulu Archipelago, Southern Philippines. Belonged to datu nobility and is battle piece. It has a silver ferrule. Pommel is small and made out of fossil elephant molar (to ward off evil influences during battle) and thus makes this a rare type of barong. Tausug tribe, Jolo Island, Southern Philippines, Belonged to datu and is a rare ceremonial type. Damascus steel blade. Junggayan pommel is kamagong wood with scrolled okir top tail and beak, and large ivory inlays. Below pommel are three sections of chased silver divided by three sections of braided silver, with brass section below. Scabbard is made of brown wood burl. Provenance: Dr. Joseph Link from Buffalo, NY who was a staff medical officer under General MacArthur in the Philippines died in 1999. 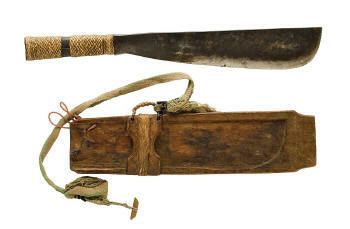 Tausug tribe, cockatu burled bunti wood hilt. Moro Wars turn of the century. Part utility, part warfare weapon. 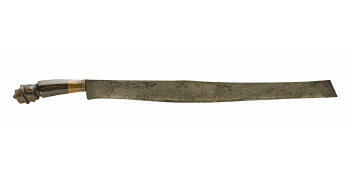 This specific type of sword has a notorious reputation as it was usually used for beheadings. Not sure the exact origin of this weapon. Original owner metioned Sibugnay Bay, Zamboanga, but he wasn’t too sure about that. Blade is laminated and heavy; with a diamond shape cross section. Spine’s base closest to the handle is 2.2 cm thick! Handle is rather simple; wood with brass tacks and low content silver bands. Moro (Maguindanao tribe? ), Mindanao Island. Damascus blade in scimitar form, double edged with one edge having a spine with 15 “X” carved talismans. 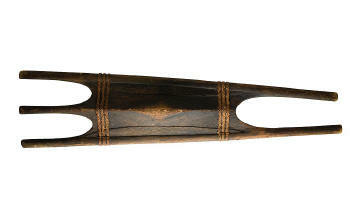 Narra wood handle has one half lighter and one half-darker, with 3 white brass bands separated by black lacquered cord. Scabbard is breakaway style of plain wood. 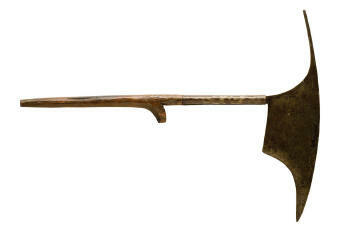 Belonged to datu entourage and is generally known to be an executioner’s sword. According to Cato, this form of panabas is relatively scarce. Provenance: Robert Cato and is pictured in Moro Swords on page 92, photograph 58, the top blade in the picture. Mid 19th century (probably Mindanao origin) with munsala strap. Blade inlaid with silver dots near tip . Hilt may represent either a Crocodile or the bird called a Swift (bird’s nest soup variety) . Undulating steel staple as hand guard. Blade: 72.39 cm laminated steel with extreme distal taper. 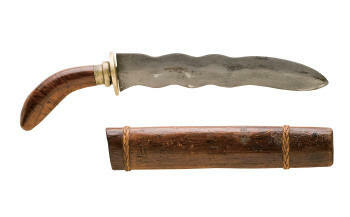 This large kampilan has the typical long blade with straight edges and terminal “spikes.” This example has a series of brass inlaid dots along the spine. Etching of the blade shows that the cutting edge was hardened using differential heat treatment. The blade shows many edge nicks from combat. The wooden cross guard has metal rings on one side to protect the hand. The handle is banati wood wrapped with cord and rattan strips. The pommel is a carved, forked piece of banati that may be representative of a crocodile’s jaws or the tail of a swift. Found throughout Mindanao/Sulu. Favored by the Maguidanaon warrior. The biggest type of sword used by the Moros. This sword has the rare scabbard with it. Scabbards on kampilan are rare since it is made to break away in half, thereby saving the warrior some time from pulling it out. One just has to strike the sword (still in its scabbard) and the blade cuts the binding that hold the two halves together. Horse hair and handguard restored. 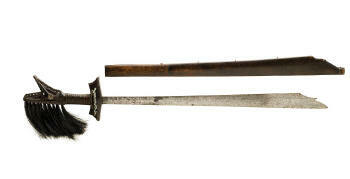 The bangkung is a rare Moro sword with a klewang style of blade, being much wider towards the tip than at the hilt. The hilt has a horse hoof pommel with plaited cord strips over a wooden handle. The blade is laminated steel and has a hardened edge. Hilt: Horse hoof type pommel hilt with jute wrapped handle with pitch. Blade: Klewang type blade with spring tempered blade. Probably Samal or Yakan tribe. Water buffalo horn hilt, silver ferrule, laminated steel blade. Banati wood hilt with brass fittings. A simple but nice example of this weapon type . Broad-bladed, double-edged dagger. Pistol grip hilt with silver ferrule and banati pommel. Silver mounted wooden scabbard. Maranao tribe, Lake Lanao region, Northwestern Mindanao Island, Southern Philippines. Possibly belonged to Dato. Double edged damascus steel blade. Okir silver over copper mounts. Laminated steel blade with one flat side and one tapered; chisel edge. 71.1cm in scabbard . This sword is characterized by the floral style pommel and was the favored weapon of the Dios-Dios cult, also known as the Pulajanes. The blade is deeply curved and the edge is chisel ground, being beveled on one side and flat on the other. This blade shows heavy age patination. The hilt is missing its usual plaited rattan wrapping. Rare Mandaya floriform paneled spear head. This exceptional piece was exhibited at the Pan American Exposition 1904. A seldom seen spear head of the Mandaya people of East Mindanao made of finely watered steel ; this piece originally from the collection of the Philippine Provisional Governor U.S. General Harold Bandholtz. Probably collected after General Pershing’s order # 11 to disarm the local tribes. Shaft length: Shafts not included. When mounted this spear is approximately 274 cm long. Shaft wood is Palma Brava with forged iron conical cap at the end. Mandaya tribe, Southeastern Mindanao island. This is a ceremonial piece belonging to a datu. Silver mounts with swirl designs. On the back of the banana leaf on the upper right section is a museum accession number in black: 33-38/70 201. Note: the Mandaya are known for their expert silver-work. Hilt: Carved kamagong kakatua shaped pommel with octagonal brass ferrule. Decorative silver discs by pommel. Blade: Deep bellied blade with distinct appendage by narrow part of blade. Bevel ground blade. Scabbard: Carved wooden scabbard with upturned scabbard toe with rattan bindings. Scabbard is painted black dye to accentuate scabbard. Carved raised wooden belt loop. Hilt: Kamagong carved kakatua type pommel with silver plates and decorated brass pins in geometric patterns. Octagonal shaped wooded ferrule. Blade: Deep bellied blade with the distinct appendage by narrowed section on blade. Blade is laminated and has a diamond shaped cross section. Scabbard: Carve wooden scabbard with up turn toe. Scabbard distinctly painted with black dye. Carve out raised belt loop with braided abacca sting type belt. Kalinga tribe (Igorot), Abra Province, Luzon Island. Datu piece. Below ferrule rest of axe is covered in pierced brass in geometric design. At bottom is ferrule made of white brass in chased geometric design. Bontoc tribe (Igorot), Northern Luzon Island. Datu. Ceremonial piece. Below ferrule rest of axe is covered in pierced brass in geometric design. At bottom is ferrule made of white brass in chased geometric design. Luzon island, steel blade and ferrule, wood handle with metal decorations in wood handle next to the ferrule. this blade has a long square tapered back spike. It was collected in the 1920’s. Blade size: blade 36.25 long x 9.5 cm wide. Yapayao tribe, north Luzon island Apayao region. Steel blade and ferrule, wood handle carved at the end. Blade size: 21 cm long x 9 cm wide. T’boli tribe, Mindanao Island, The hilt is made of cast brass. Bronze-brass mounts with geometric designs. Blade has 2 rows of twist core damascus steel. Hilt: Wooden hilt with octagonal iron ferrule and S guard. Peened tang construction. Blade: Laminated steel single edged blade. Scabbard: Tooled leather scabbard with leather throat and leather belt and buckle. Hilt: Carved wooden hilt with octagonal iron ferrule and S knuckle guard. Peened tang. Blade: Forward curve double edge blade. Laminated steel blade. Hilt: Carved wooden hilt with octagonal iron ferrule and D guard. Decorative brass tacks. Peened tang. Blade: Forward curve double edge blade. Laminated steel blade with file work by ricasso. Scabbard: Tooled leather scabbard with leather throat and silver tip at scabbard toe. An older tenegre with simple wooden hilt and guard. The crudely carved pommel vaguely resembles the outline of the usual deity heads (see Numbers 43-46). The blade is laminated and the edge is chisel ground. After etching the blade with weak acid it can be seen that the edge was hardened by differential heat treatment. The wooden scabbard is typical of these swords before 1900. Diety head hilt. Intricately carved. made out of Kamagong (iron wood). Not much is known about these mysterious hilts; who or what they represent. The disc guard is made out of carabao, or water buffalo horn. The blade appears to be monosteel, made from a raspfile (notice the faint scale-like engravings on the blade). 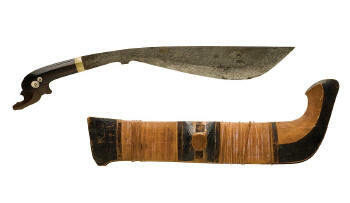 Typical of Visayan blades, it has a bevelled edge; flat on one side andchiseled on the other side. Usually denotes if the original owner is left or right handed. 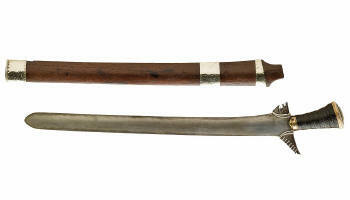 Scabbard style is also typical of Panay/Negros Islands; leather throat with brass bands. Hilt: Carved wooden figural Diety hilt. Carved wooden guard with off set shape for maximum finger and knuckle protection. Blade: Chisel ground blade with a clipped point tip. Scabbard: Wooden scabbard with brass bands and brass scabbard tip and by scabbard mouth. Thinner and flatter are typical characteristics. Hilt: Carved wooden figural deity hilt with silver plates and silver wire work to accentuate the diety’s facial features. Octagonal silver ferrule and carve carabao (native domestic water buffalo) horn disc guard with silver trim. Silver ferrule and silver disc guard trim are fully engraved with floral decorative motif. Provenance engraved on ferrule Barotac on one side and Panay on the other. Blade: Chisel ground blade with a down ward klewang shaped. Hilt: Carved wooden figural deity hilt with octagonal silver. Silver ferrule and silver disc guard trim are fully engraved with floral decorative motif. Origin: Capiz, Northern Panay Island in Visaya. This sword is a Spanish colonial interpretation of a Moro kris. The single edged blade is laminated steel (piled rod construction) which has been forged into nine waves (luk) and ends with a section of straight blade at the tip. The hilt has a steel S-guard, a steel ferrule, a horn handle, and a steel end plate over which the full length tang has been peened. Unknown origin. This specific sword doesn’t seem to fit in any category. the handle is made out of carabao horn, with silver beads for eyes. It appears to be in the shape of a snake. Even the d-guard is fashioned with a snake like tip. Samar/Leyte/Bohol area at the turn of the 20th century. 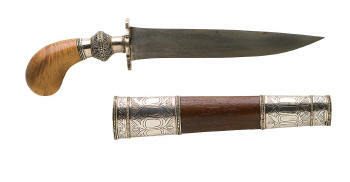 Scabbard is made out of Kamagong, with excellent wide silver bands etched with floral designs. Tagalog tribe, Southern Luzon Island. Damascus steel blade. Behind the guard is an ornate silver ferrule that has a ring of beaded silver “pearls” at the top and bottom of the ferrule. Ilokano tribe, Ilocos Norte, Northeastern Luzon Island. At base of blade there is an engraved triangle with a star at each corner and a sun with a face in the middle and worn remains of a banner with “Liberitad” (“Liberty” in Spanish). The triangular device is a later Katipunan symbol officially used during the Republic of the Philippines from 1898-1901. On the other side are engraved the words “Filipinas”, Philippines in Spanish (the country name in use at the turn of the century), “Ylocos Norte” (the province) and “Laoag” (the capital of Ilocos Norte). The hilt is made of carabao horn with a top and bottom ferrule made of bronze. Note: this is a rarer type of dagger not often seen. Period: Post 1900, Katipunan Era. Hilt: Carved fluted carabao horn hilt with brass wire inlaid in flutes. Blade: Chisel ground blade with a forward down and upsweep shaped blade. Scabbard: Tooled leather scabbard with leather throat. Origin: Southern Luzon, possibly Batangas. Hilt: Detailed and intricately carved carabao horn hilt in the shape of a horse head detailed silver reigns and eye cover. Round silver ferrule. Intricately carved floral motif Peened tang. Blade: Chisel ground blade with the clipped tip. Blade is inlaid with silver in floral motif. Hilt: Carved carabao horn in the shape of a human figural head with hat/cap. Hilt with octagonal brass ferrule and cap with peened tang construction. Blade: Long clipped tipped blade. 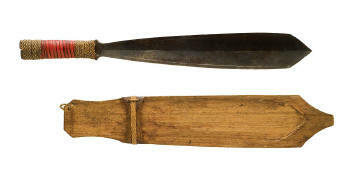 Typical blade shape used by Katipuneros. Ifugao tribe. Luzon mountain province. Kalinga tribe (Igorot), Luzon Island. The shield face is paneled in an hourglass form, a sacred talisman signifying divine presence (Florina Capistrano-Baker, “Divine Spheres of Protection” in Protection, Power, and Display: Shields of Island Southeast Asia and Melanesia (ed.by Andrew Tavarelli, Goston: Boston College Museum of Art, 1995), pp.60-61).